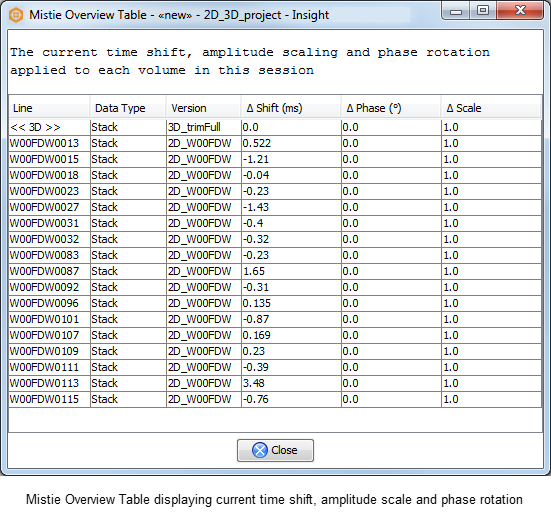 Once you are done with the manual or automatic mistie corrections on the volumes, you can view any current time-shift, amplitude scaling and phase rotation applied to the volumes. In the Control Panel, go to the Tool menu. Click Mistie Overview Table to view the mistie summary. Click Close to close the Mistie Overview Table. Tip: Copy the contents of this table to the clipboard by right-clicking anywhere in the table and selecting Copy as CSV.